next April 3, 2015 2:01 p.m. The future of fashion is in 3-D-printing labs. 3-D printing might be nerdy, but it is also rare and expensive — two qualities that fit right into the ideology of the fashion industry. Fashion houses aren't quite ready to let 3-D-printing computers do a designer's job, but the industry knows that the more expensive and unattainable something is, the more people want it. Companies like Nike are experimenting with 3-D-printed shoes, whimsical Japanese manicurists are giving us dreams of 3-D-printed fingernails, and jewelry designers are delivering of-the-moment pieces at relatively inexpensive prices. It's not hard to imagine the Diors of the world adopting this technology to produce unique, high-end clothing. Later this month, New York’s first-ever 3D Print Week is giving us a preview of that world with a fashion show featuring both prominent and up-and-coming 3-D-print designers. Natacha Alpert, who’s worked with footwear designers for 14 years, is partnering with Replica Labs to produce the show, and she promises pieces that even the 3-D-printing market has never seen. We picked Alpert’s brain about what to expect at her show, the history of 3-D printing in design, and how 3-D printing will eventually take over everything. When did 3-D printing and fashion start to intertwine? I would say that 3-D printing in fashion has been around for the past ten years. When I was at Reebok in 2008, we used it for prototyping. Before we opened a mold of an outsole of a running shoe, we had a prototype made. In the fashion industry, we’re seeing very high-end 3-D-print designers collaborating with fashion brands, so they’re slowly bridging the gap. Once big brands become early adopters of 3-D printing, you’ll start to see the Marc Jacobs and the Chanels of the world use it, too. How many 3-D-print designers are out there? A lot. I don’t know the exact number, but I’d say there are thousands. Why did you choose the 13 in the show? They range from extremely experienced designers to a recent FIT graduate. I wanted to give the show a certain look and feel, so that it looks a little more high-end; I wanted to show the fashion industry that 3-D-printed clothes don’t have to look like strange, space-y outfits. A lot are also big designers— Frances Bitonti designed a gown for Dita Von Teese, and Bradley Rothenberg, who’s unveiling a piece at the show, did the 3-D-printed wings for the Victoria’s Secret fashion show last year. What’s the most remarkable thing you’ve seen 3-D-printed? The most impressive thing that I’ve seen is the Kinematics dress, because it’s all printed in one piece; normally with a dress you have to put the pieces together. 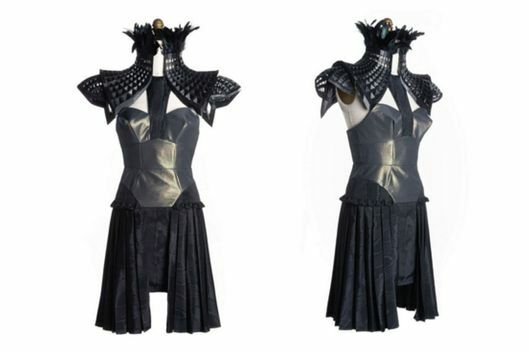 The algorithm for the Kinematics dress was created so that it would print folded, and when you pull it out of the printer it unfolds. What are the advantages of using this sort of technology? Well, first, with 3-D printing, there are no minimums. It will be totally ecofriendly, so you can recycle materials and you’re not wasting anything. Even with cut and sew, you have to cut around the fabric, but with 3-D printing you get only that product. 3-D printing also happens much faster than normal development, which can take three to six months. It’s also completely customizable; a designer can take someone’s measurements and create a design for one consumer. So in the future, Claire, you could have a pair of shoes that are completely fitted to your foot, to your exact symmetry — that doesn’t exist anywhere in the world. What sort of materials can you use? There’s such a long list. Anything from memory foam to soft nylon, plastic, titanium, gold, or wood. A soft cotton fabric does not currently exist, but it’s in development. No. In fact, I think high-end designers are going to lead the process. I would predict that more of the high-end brands will adopt 3-D-printed products first, and then they’ll go mass. So designers will still be able to lead the process, but there will be a little more competition because consumers will become creators too. For the show, what should people be most excited about? Well, Melinda Looi’s piece at the end is going to be the first ever done in the world. It’s unbelievable, but I can’t say what it is! How Will We Worship in 2050? What Are Driverless Cars Actually Good For?